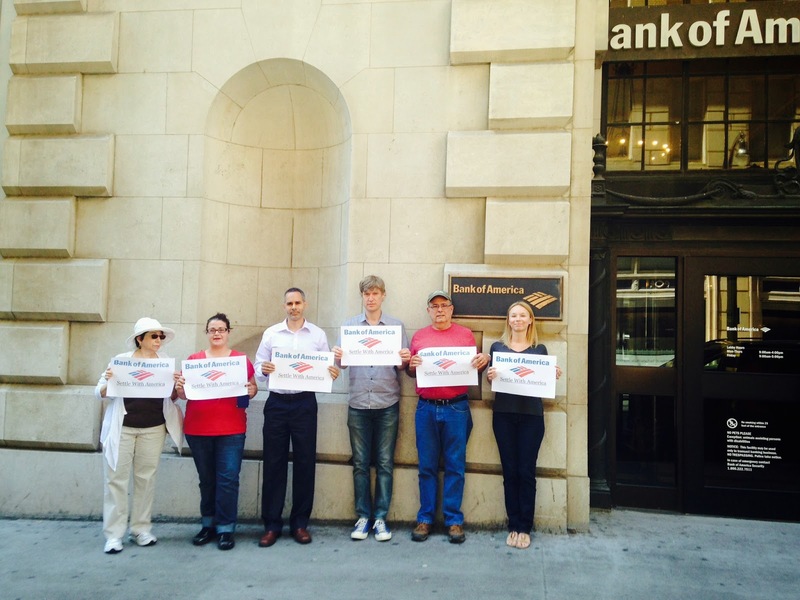 Bank Of America: Settle With America! 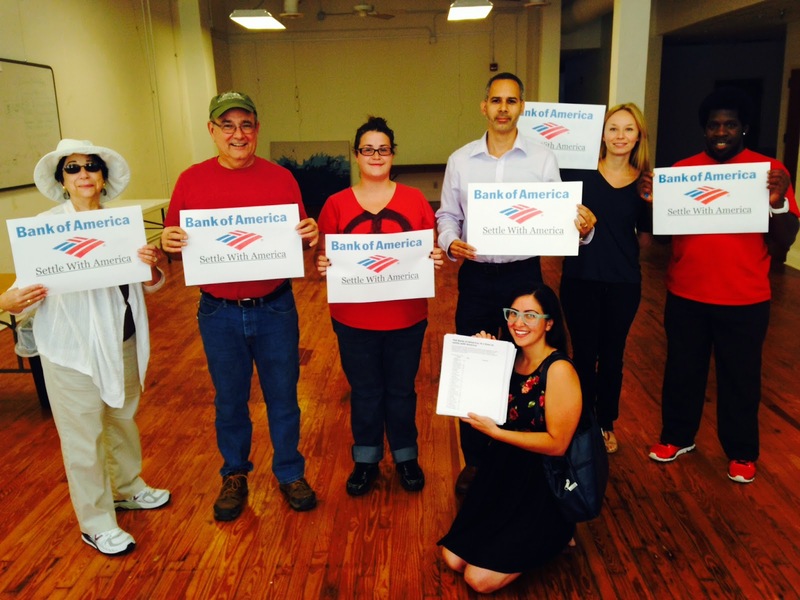 Last week the Justice Department reached another record-breaking settlement with Bank of America-- this one worth $16.65 billion, with close to half of it being used for relief to homeowners and hard-hit communities. Unfortunately, as we've seen from past settlements, the money doesn't always get to the people that deserve it the most. A few weeks ago, over 10,000 people signed a petition telling Bank of America to "settle with America." 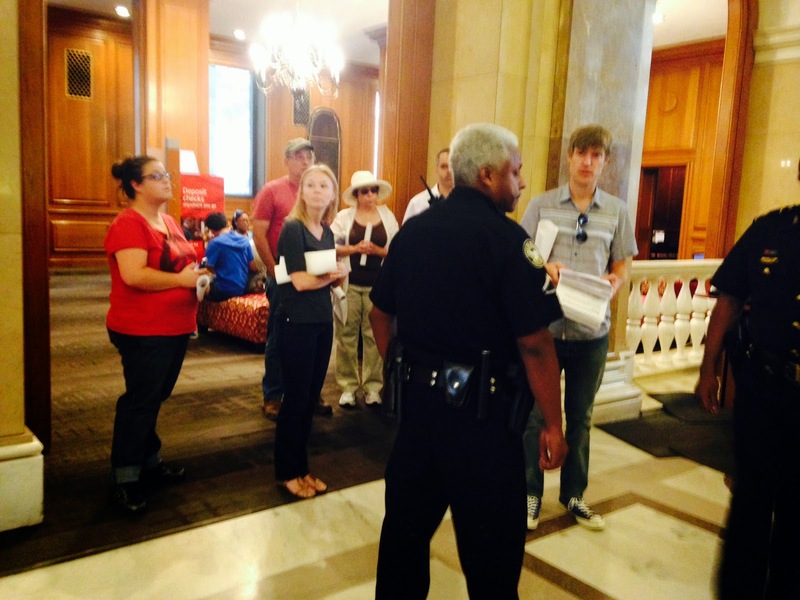 Today Occupy Our Homes Atlanta and American Friends Service Committee joined dozens of other groups around the country as we delivered those petitions to a Bank of America branch in an effort to make our voices heard. With a new settlement with the Department of Justice under negotiation - possibly worth $17 billion - we demand you meet directly with families affected by your peddling of toxic mortgages and destruction of our economy. Only when you understand what your actions have caused will you be able to create a settlement that helps fix what you broke. Once we entered the bank branch we took a seat in the waiting area and made it clear we were there to simply deliver a petition signed by thousands of American who have lost their homes and their wealth as a result of Bank of America's practices, we also made it clear that we planned to leave the branch once the petition was delivered. Instead of being conscious of the fact that our petition represented millions of lost homes, broken dreams, and broken promises, instead of simply accepting the petition and politely seeing us on our way Bank of America called the police and threatened to have us arrested despite the fact that we were being lead by a Bank of America victim who despite never missing a payment lost every bit of wealth he built over 15 years of home ownership as a result of Bank Of America. It's this type of disregard, even disdain, for everyday hardworking Americans that drives the concern around who will actually receive any of this relief money. To date the victims of the Wall Street created housing crash have seen very little relief from the billions upon billions of national settlements. 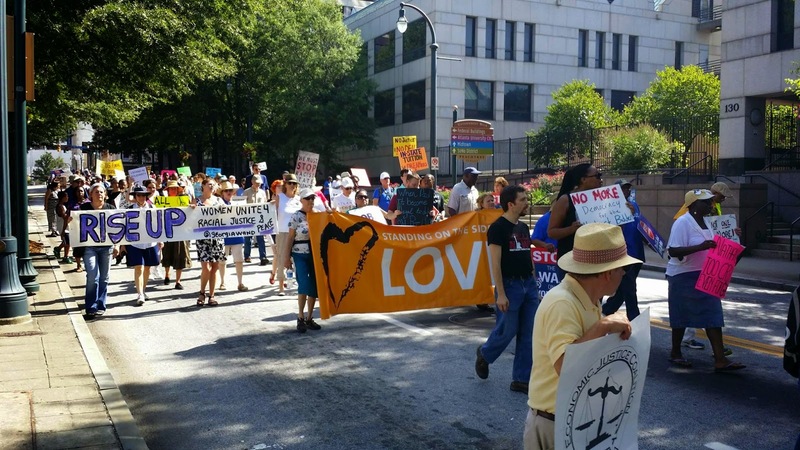 Over the last month Moral Monday GA has traveled to 16 Georgia cities in an effort to build the movement Georgia needs to turn the tide against the extremist agenda that continues to negatively impact most Georgians. While on the tour the shooting of unarmed Ferguson, MO youth Mike Brown took place and has forced the national to take a deep look in the mirror. 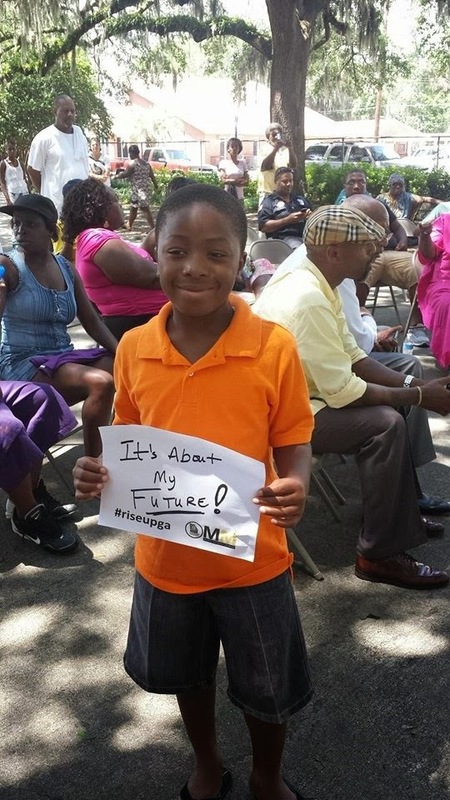 Now more than ever our young black youth feel unsafe anywhere. 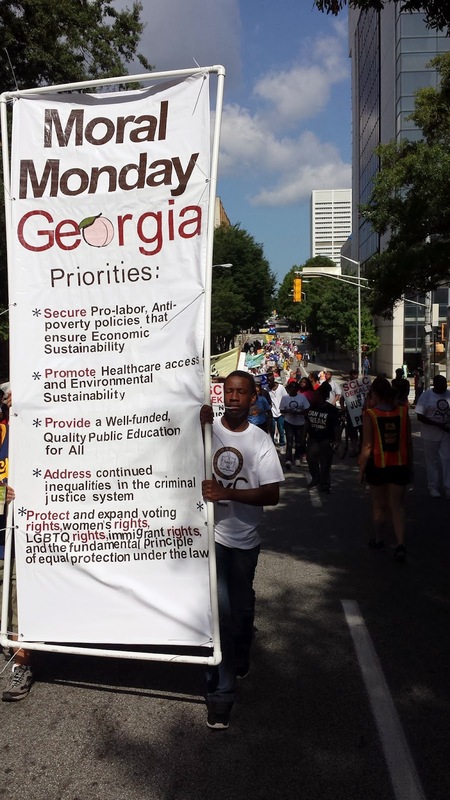 The inequities in the criminal justice system have been front and center on Moral Monday Ga’s political platform. So we decided, along with an amazing group of young people who have organically self-organized Ferguson solidarity marches in Atlanta, to merge on these two movements together. On Saturday August 23rd regular everyday people from all over the state joined us for a Moral March on the Capital. We came together for a massive Moral March on Georgia from Woodruff Park to our state Capitol. 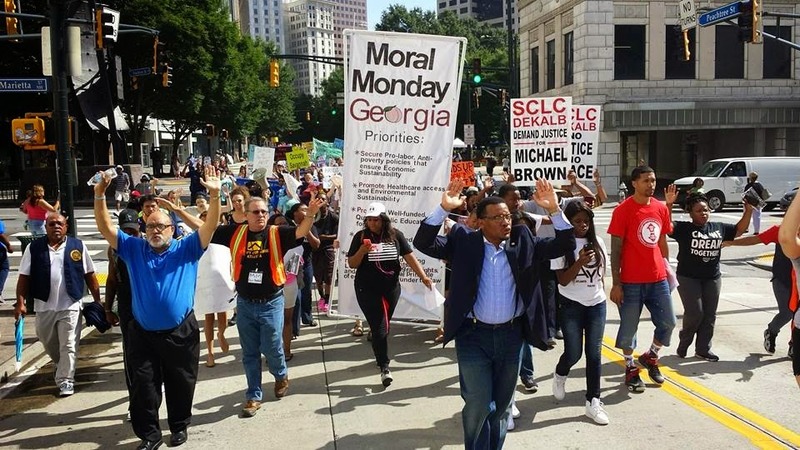 The Moral March on Georgia is part of a southern wide strategy to build power against the extreme, economically insane policies that have seen our wages decreased, taken our jobs, seen our homes foreclosed and rent skyrocketed, our children’s education defunded, young black males criminalized and targeted, and our communities less safe. Actions had been planned in 22 states. Once at the capitol we presented our issue priorities and asked those in attendance to ratify a Moral platform by signing the huge document. Forward Together means that all of our destinies are linked, that we can't afford to work in issue and organizational silos. Gay straight, black, white, brown, male, female, old, young and everyone in between. We can no longer afford to allow a small group of extremists benefit from separating our communities. Moral Monday Georgia ended it's week of action today, which marks the 51st anniversary of the march on Washington. 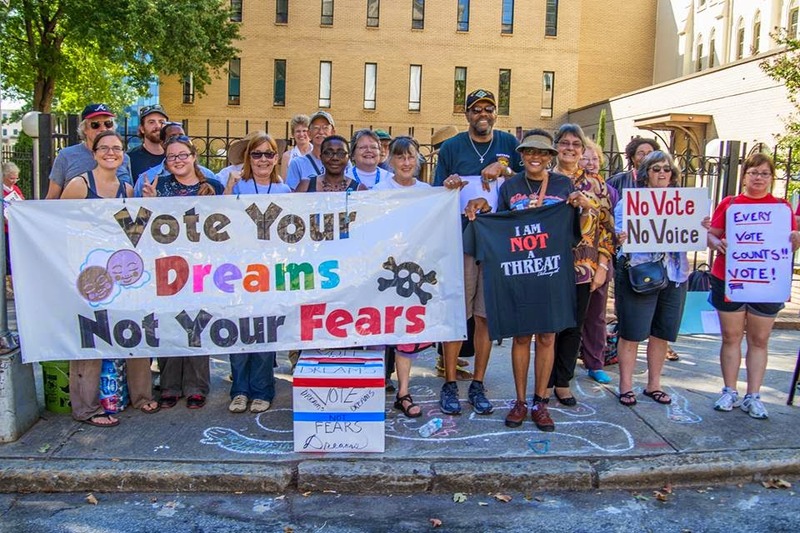 Like many other Moral Monday movements our them today was, "Vote your dreams not your fears". Fear mongering seems to be a pretty consistent strategy to separate communities that have a clear vested interest in learning to work together. We can't afforded to allow the same small group of folks feed off our unfounded fears, we can't afford a political landscape that pressures folks into voting against their own interests, we can't afford a system that continues to benefit those that already have an over abundance of resources while the rest of the state falls behind. *Protect and expand voting rights, women’s rights, LGBTQ rights, immigrant rights and the fundamental principle of equal protection under the law. The recent murder of unarmed teenager Mike Brown by a Ferguson police officer while his “hands were in the air” has racial tension at an all-time high. Thousands have flooded to Missouri to demand justice for the high school graduated headed to attend college. Mike Brown’s life mattered. 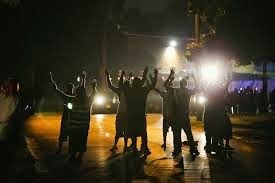 National community organizations cannot develop effective solutions and strategies for Ferguson if their organizers have not spent time in the area to learn the landscape and culture. 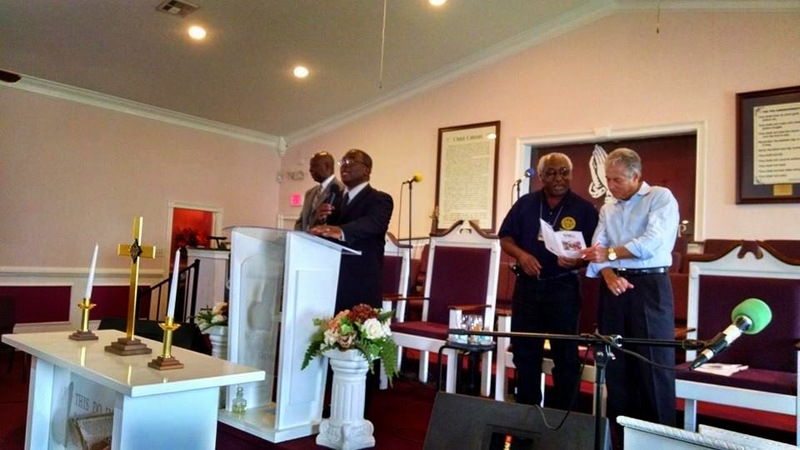 Our best service to the community of Ferguson is to tell the truth. It’s our civic duty to ensure that their voices are not silenced. Carey Jenkins, Program Coordinator for American Friends Service Committee, went to Ferguson to support young leaders on the ground. “Some were tear gassed, shot with rubber bullets, many were arrested all for nonviolent protest. Human and Constitutional Right are being violated. Babies, women, elderly, handicapped, and journalists are being bombarded with tear gas. None of that mattered to the police as the media tried to paint a negative picture of peaceful protesters what I witnessed were those sent to protect and serve as the aggressors." Stated Jenkins. There's a silver lining to the madness we have seen unfold in Ferguson. Young people of color are self organizing around the country, holding rallies, walk outs, and group discussions. Vital conversations about race are being forced onto our TVs, social media news feeds, campuses, and other public spaces. The generation currently coming of age is believed to be the most progressive, least homophobic, least racist generation in American history and there are signs they are awakening to spark a movement our country has been in dire need of. Racism, lack of access to political power, and wealth inequality aren't problems solved with a few protests; it will take more than a movement moment. 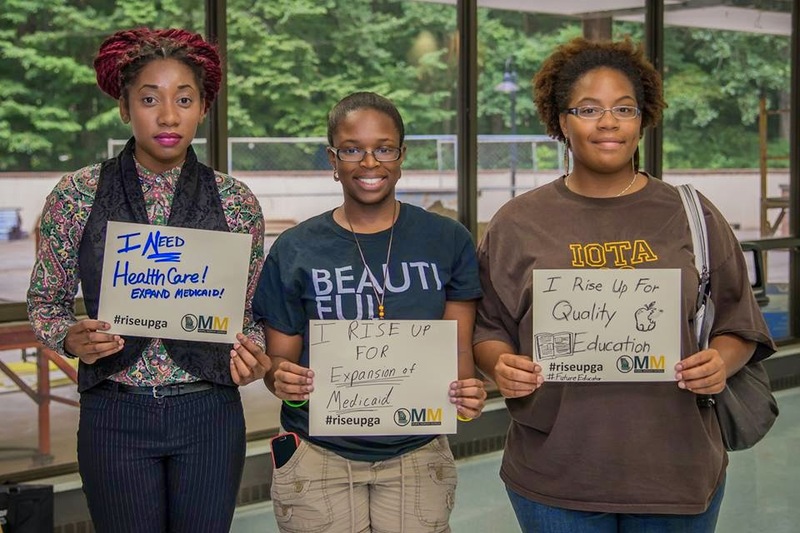 Is this generation ready to do the hard work of building and leading the movement our communities need? That's the question many are optimistically asking. Want to contribute resources to on the ground organizing inFerguson? Click here. What an amazing stop to end the Jailed for Justice Tour! Emerson UU and Cobb County NAACP rolled out the red carpet for our amazing panel and we were able to end this incredible tour on a high note. One of our larger panels, on our last night of the tour we heard from 5 people who were arrested, including UU Minister, Karen Reagle. Two of our panelist, Bob Goodman and Sara Gregory, were telling their stories for the first time and were terrific! It was amazing to see the relationship that was created around the Jailed for Justice Tour. 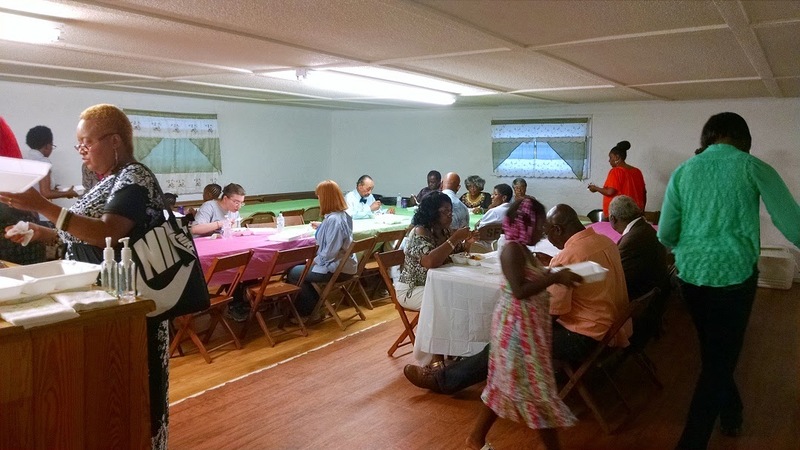 The UU congregation and the Cobb Co. NAACP joined together to cohost the event and built a new working relationship in process that will help MMGA grow in Marietta. 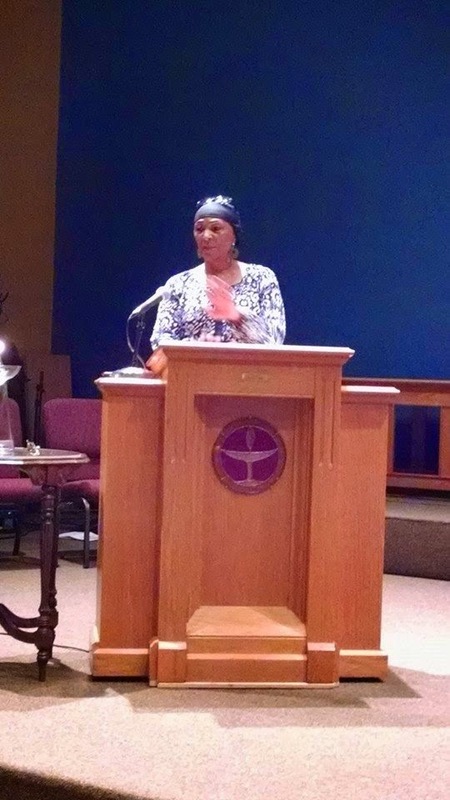 As we heard from the Cobb Co. NAACP President from the pulpit of the Emerson UU Sanctuary, I knew that a new coalition had been formed, Moral Monday Marietta! This will only strengthen the Moral Monday Ga coalition and it added to the power of our last tour stop. The mood was festive as people crowded into the beautiful Emerson Sanctuary, it was a great multi-generational crowd, who were on their feet after hearing from our panel. After hearing the personal stories of our arresttee's for the past 15 days I thought it might become repetitive but I was pleasantly surprised! I was still enthralled and inspired by each one of our panelist day after day. Even for the people who had spoken before, I learned something new every time. As I heard each person's story I was reminded of the real beauty of Moral Monday. This movement is about each one of us. Individual people standing up and saying they aren't going to take it anymore. When we demand a better life and better world it is obtainable, if we work together. Moral Monday has given us that opportunity. It has given organizations a place to come together and create a space to work together. It has given us a call to action, a rallying cry for us to mobilize around. 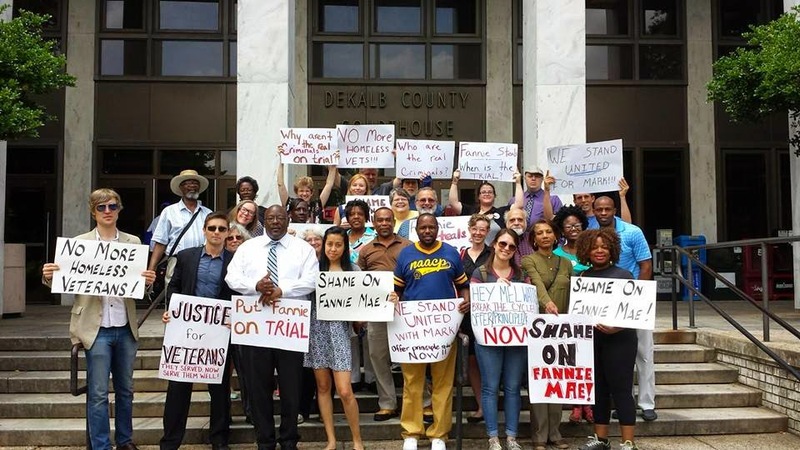 I cannot wait to see what Moral Monday will look like in Marietta and in each location we stopped on during the Jailed for Justice Tour. 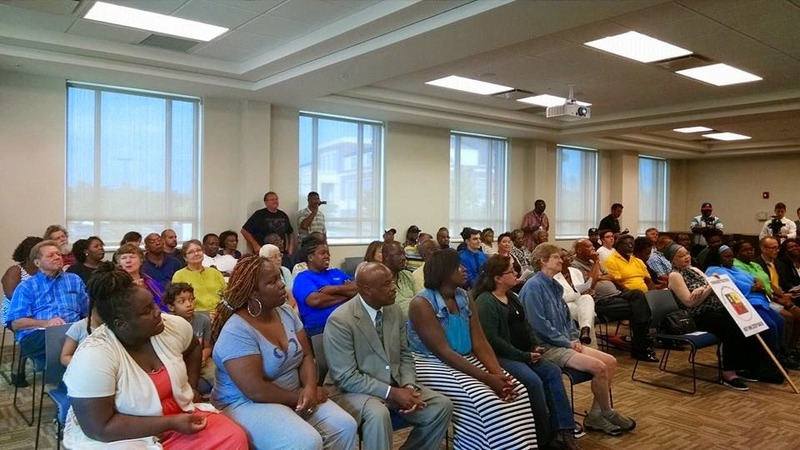 As I look forward to the Moral March on Georgia on August 23rd I know that the people we met today in Marietta will help us raise our voices and demand change in Georgia. We will demand a better state and we will get it, because united we stand strong. 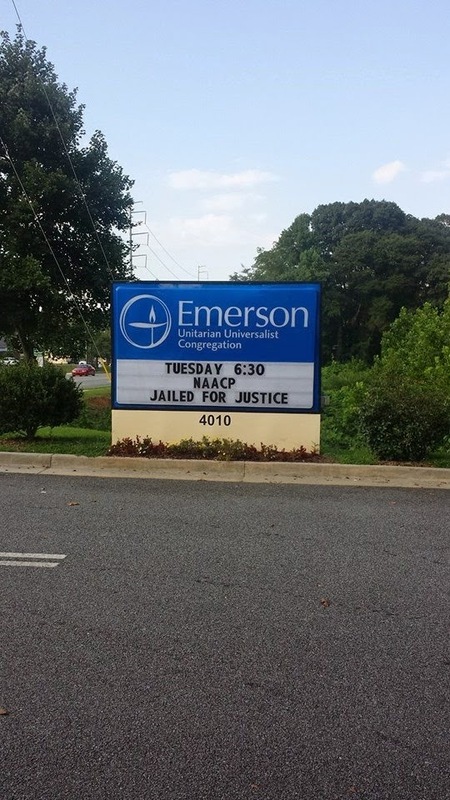 It was an eventful day in Columbus Georgia for the Jailed For Justice Tour! Stop #15 of the Jailed for Justice Tour would not have been complete without speaking out against an injustice happening right in Columbus. We decided to draft and hand deliver a letter to the Mayor of Columbus, Teresa Tomlinson, urging her to uphold the First Amendment in Columbus by making sure that the School of the Americas Watch be permitted to hold their annual vigil. Held in front of the gates of Fort Benning, organized by the Schools of the America Watch, this peaceful rally and vigil has been held at the gates of Fort Benning for 24 straight years; 2014's vigil is set to be the 25th. The movement has never been denied a permit. One irony is that if the military should stand for anything in this country it should be protecting our constitution, not exporting war, counter insurgency, and nation building, which is what the School of the Americas(or WHINSEC as they now call it) does behind the gates of Fort Benning. After delivering the letter we decided to head to the tour stop and I believe we were greeted by most of the media outlets in the Columbus area, and more importantly a really huge crowd! One thing that this tour has made clear it that folks are ready for a Moral movement in Georgia and judging by the excitement in the air last night Columbus is ready to lead the way! There were several hundred chairs set up and by the time we got started there seemed to be at least fifty people standing, we simply ran out of room. The issues on the minds of folks in the community who gathered with us weren't unlike other concerns we have heard from around the state. People are living with an unfair criminal justice system that sees young black males as targets and revenue sources once placed in prison. Communities are seeing ever decreasing social services budget that are hitting there communities hard. We also heard from Columbus, and from around the state that people were unhappy with the governors' refusal to expand medicaid, and that we needed to work on gun violence in our communities. We look forward to seeing our brothers and sisters from Columbus in Atlanta on August 23rd when we hold our Moral March on the Capital! If one word could sum up our Rochelle stop it would be passion. Everywhere we have gone, all of the people we have met, have shared the belief that together we can and will make change. Rochelle was no exception. It was so inspiring to see person after person flooding into the church to take part in stop 13 of the Jailed for Justice Tour. Here is this tiny little town, we saw one of the biggest turn outs of the entire tour and the crowd was ready. 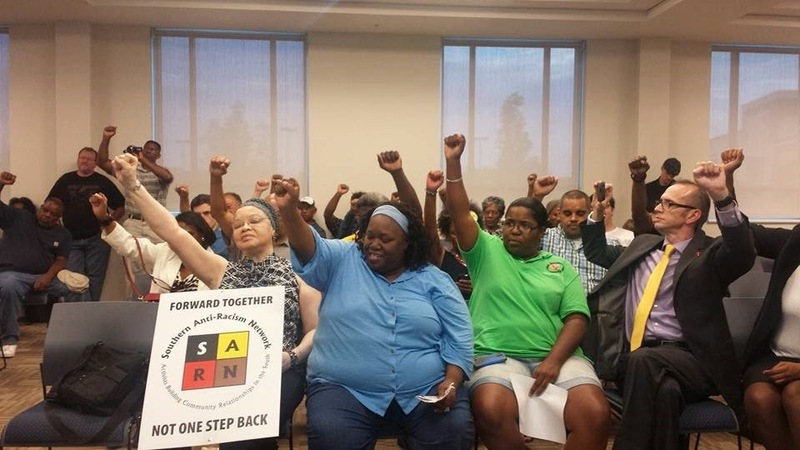 During the community discussion portion of the program we were troubled to learn that despite the fact that a large portion of the population of Rochelle is black there are no black bank employees, no black law enforcement, and there may not be any black school teachers. 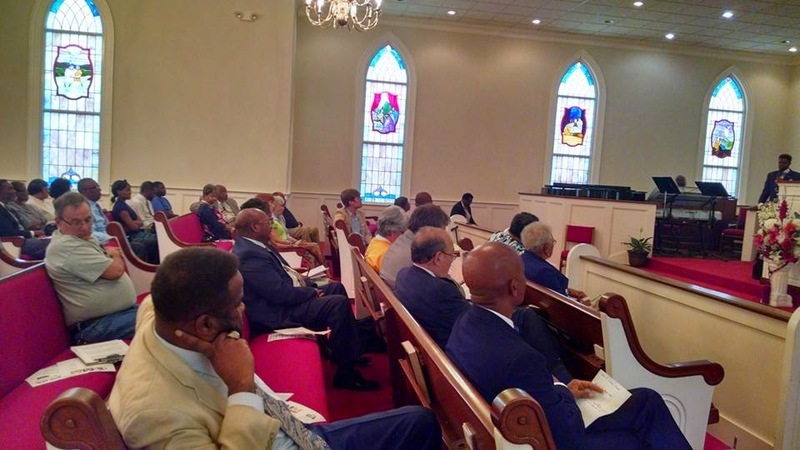 Segregation is alive and well in Rochelle Georgia, and folks are ready for a Moral Movement aimed at shaking a status quo that isn't working. Rochelle is no stranger to movement, in fact just last year Rochelle made international news when one high school student decided to organize the cities first integrated prom. It’s hard for some to imagine but the civil rights movement simply didn't fully take root in parts of the deep south. We were truly honored that the young bold organizer, Mareshia Rucker, that lit that spark was among the attendees last night! It was truly an honor to get to know her! 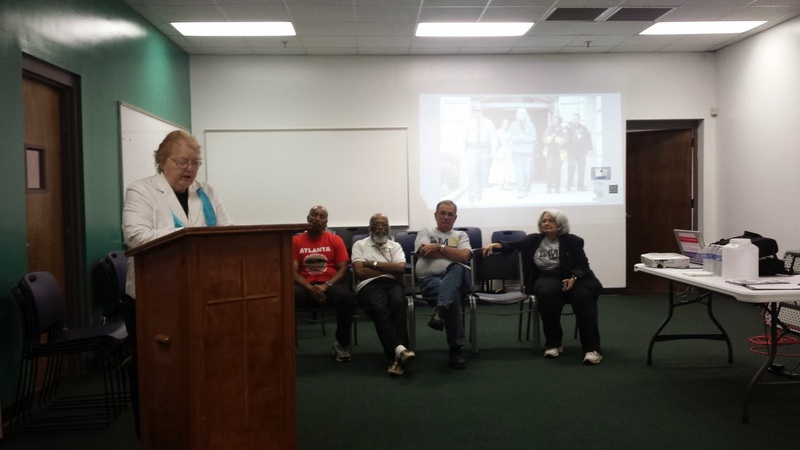 We are excited for the future of Moral Monday in Rochelle, during our community conversation there were even talks of having a march at the county courthouse. We look forward to that day when we can stand beside our brothers and sisters in Rochelle. 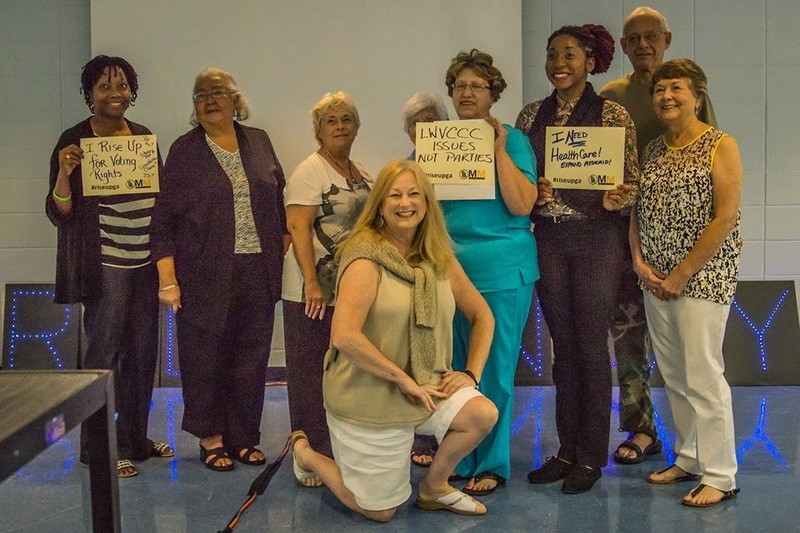 Waycross Georgia was the 11th stop of the Moral Monday Jailed for Justice Tour on August 7, and the excitement across the state continues to build. 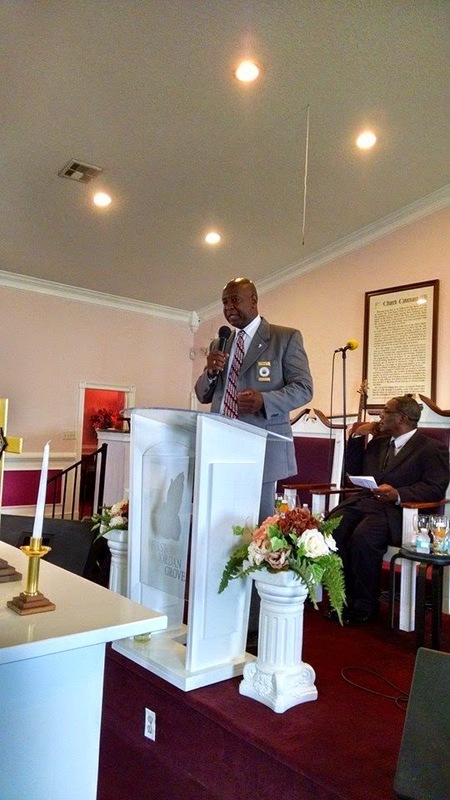 We were hosted at the Gaines Chapel AME Church, which we learned was the oldest Church chartered in Ware County. 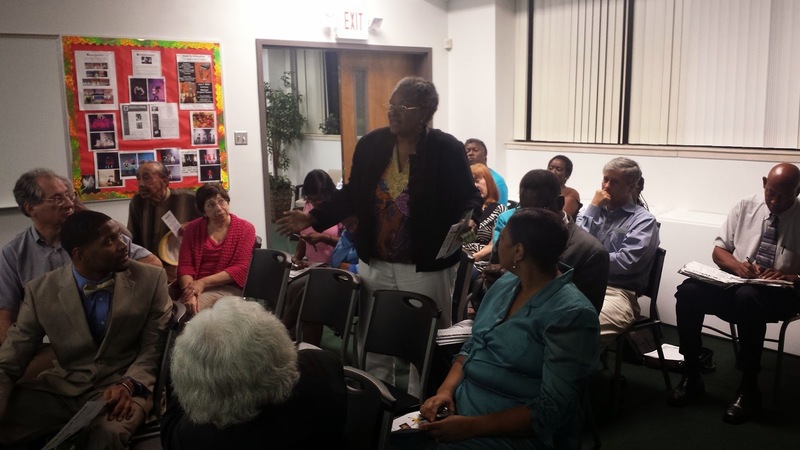 The audience and program included many community leaders all concerned about the problems that affect Ware County citizens. During our community conversation it was revealed that the county currently has an unemployment rate 2 percent higher than the national average. 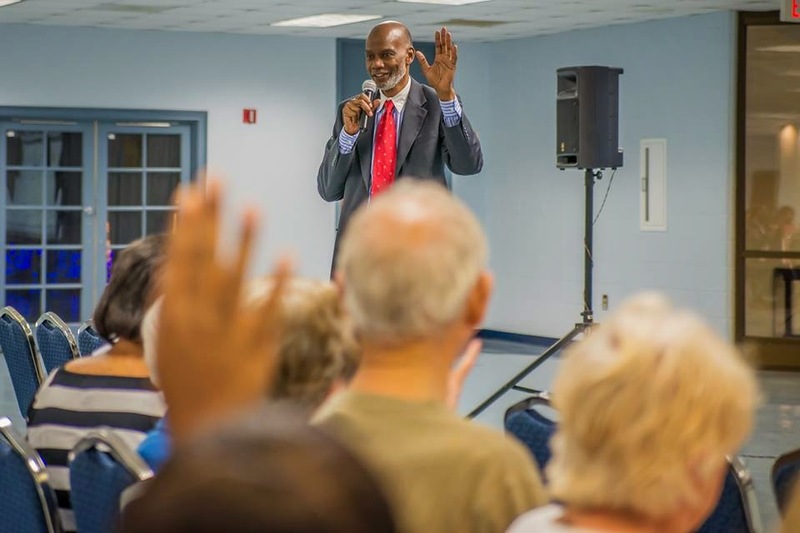 The citizens also cited concerns about citizens being victimized by the prison industrial complex; one of the most immoral trends happening in the country as a whole. Quality education is another primary concern in the area. 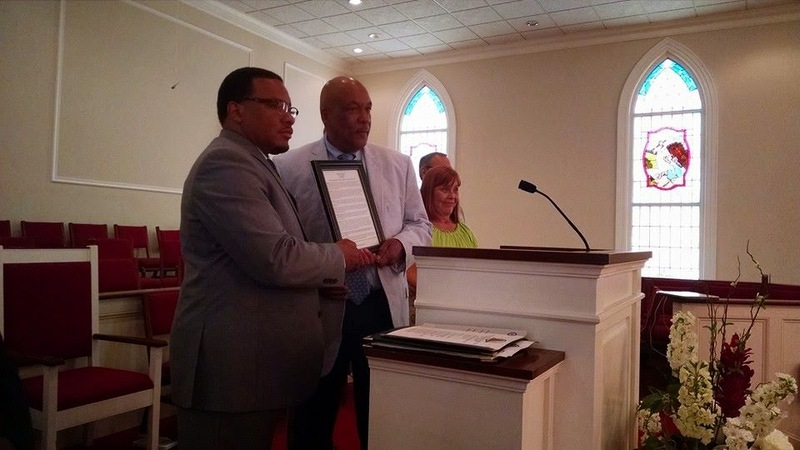 The Mayor of Waycross honored us with a Proclamation making August 7, Moral Monday Jailed for Justice Day in the city. Such was the welcome we received and it continued throughout the program. 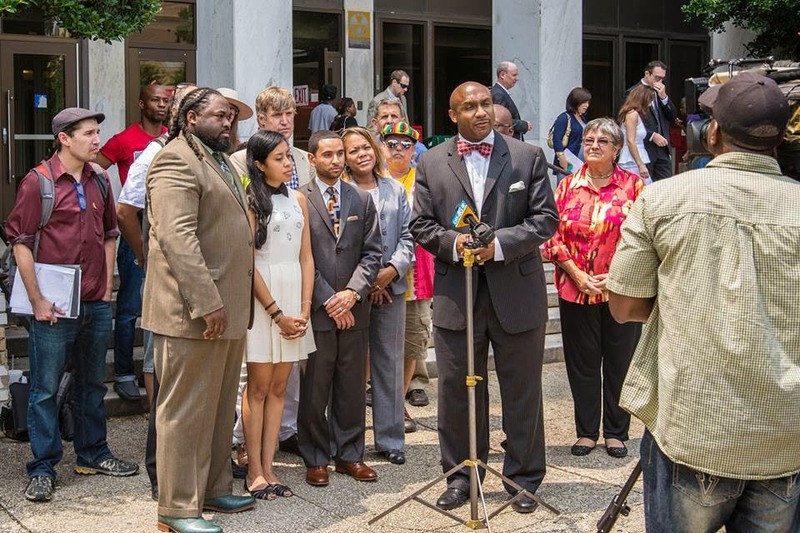 After the Mayor, City and County commissioners, and leadership of the NAACP from both Ware and a neighboring county addressed their constituents and memberships; the of the Moral Monday arrestees spoke to the crowd about what prompted us to take an arrest to draw attention to important issues facing our state. I was one of those speakers. As I told the story of my activism and my arrest in protest of the SYG laws in Georgia, I could feel the enthusiasm of the people for such citizen activism. I heard many an AMEN! when I expressed my concern about the travesty of the school to prison pipeline which is enslaving so many of our young black men, often for minor non violent crimes. I could see the pain in the faces of black parents when I talked about the murders of young men of color, and the perpetrators walking free. When I called this what it is, Modern Day Lynchings, the citizens applauded in agreement. Two of my fellow arrestees also spoke, and were received in the same warm, accepting manner. 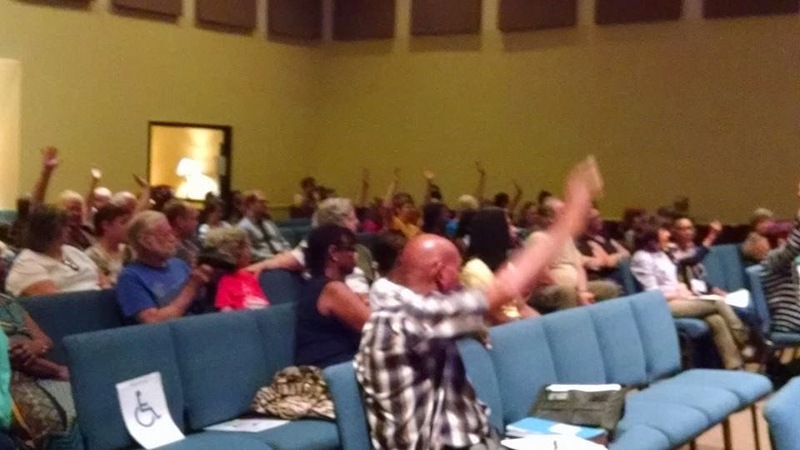 There was discussion of next steps to create Moral Monday Waycross, and of what that might look like. We got a commitment from these enthusiastic leaders to bring 2 bus loads of people to Atlanta on the 23rd of August for the big planned Moral March on the Capitol in response to our appeal to join us as a part of a southern solidarity call to action by Reverend William Barber, the founder of the Moral Monday Movement. 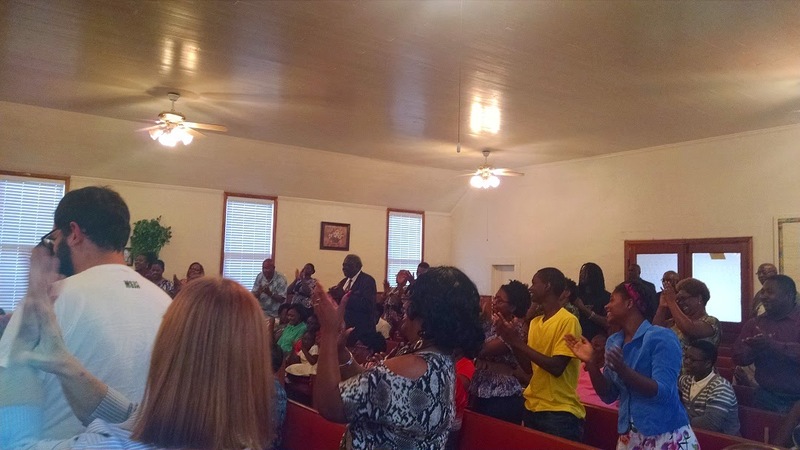 As the enthusiasm continues to grow, the Tour moves on to Historic Macon, Georgia on August 8. We look forward to seeing our new friends from Waycross in Atlanta in a couple of weeks on the 23RD of August. We where greeted with a news crew interested in covering the story of the Moral Monday movement spreading to Macon Georgia, which was a great start to an eventful evening on our 12th city on the Jailed for Justice tour. The panel of Moral Monday Georgia arrestees was once again beautiful and truly inspiring, one highlight was civil rights veteran Rev Fred Taylor, who has been arrested 28 times! 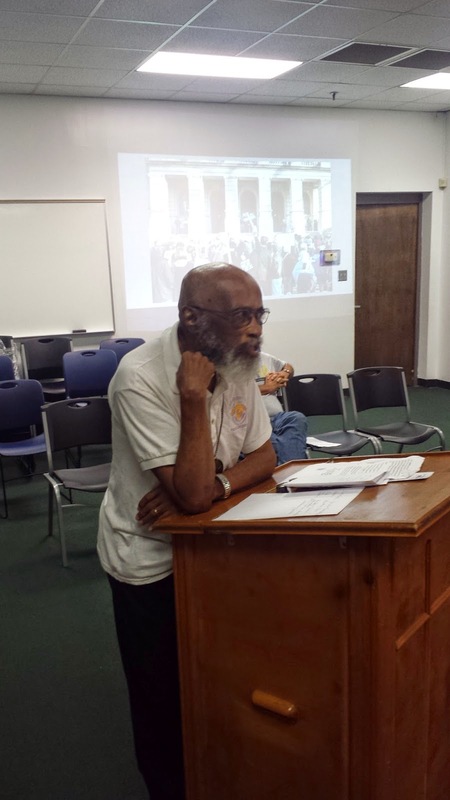 Rev Taylor talked about the spiritual aspects of committing his body to civil disobedience and his willingness to endure the consequences in order to bring about real social change. 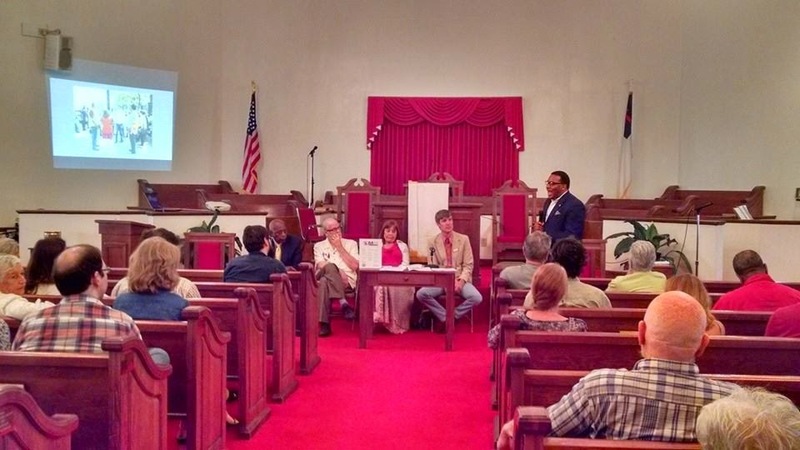 The highlight of the evening for many was the community discussion about issue folks in Macon would like to take on and what a Moral Monday coalition would look like in Macon. Many issues were touched on but the one that seemed to be on folks mind was the extreme inequalities in the criminal justice system and the targeting of young black males in the Macon area. Tales of roadblocks on Thanksgiving and communities losing their sons to the prison industrial complex were far to common in the crowd. 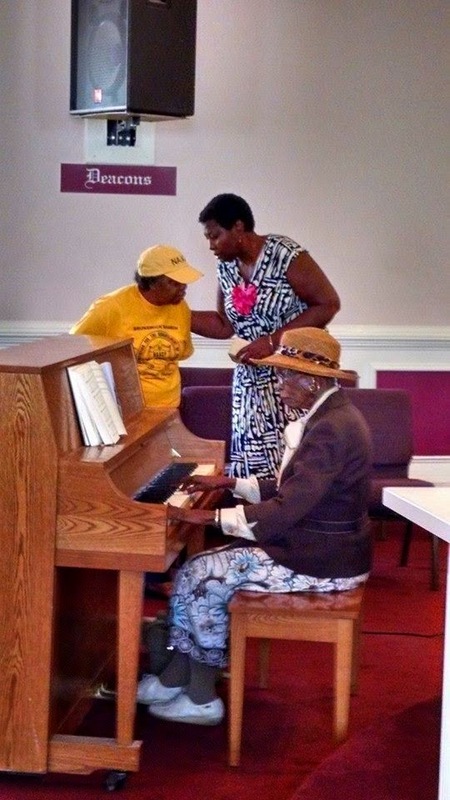 Folks were clear the Macon needs and wants a Moral movement that is both locally strong and connected through out the State of Georgia. Several in attendance committed to help organize local Moral Monday Macon meeting and organize transportation to the August 23rd Moral March on Georgia. 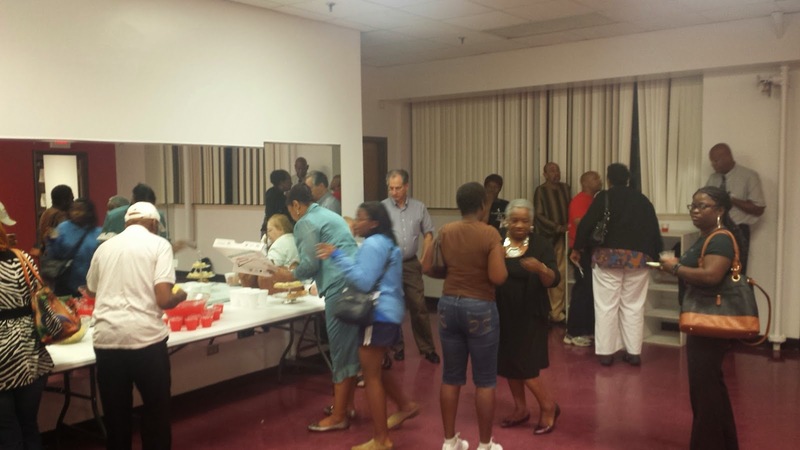 After the event the NAACP hosted a lovely reception for all who attended. It was another lovely evening, we are truly exciting to continue to build relationships with local organizers in the Macon area. 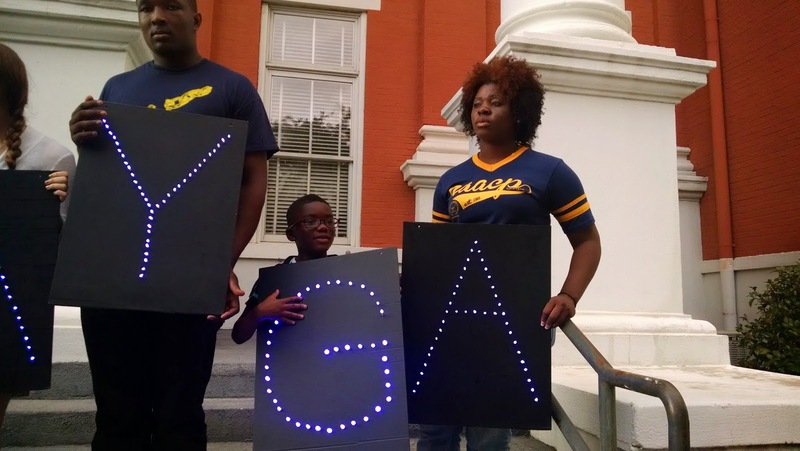 A statewide movement isn't truly statewide without the heart of Georgia; Macon! Brunswick is fired up! Probably the best community conversation we have had, Brunswick was a lively crowd that wasn't afraid to share their hopes for a better neighborhood. Brunswick is affected by a myriad of issues; in fact, they are a microcosm of the all of the issues affecting the entire state. Lack of jobs, affordable housing, poverty, and increasing victimization by the for-profit prison system, and environmental violence are not just systemic issues we face as an entire state and nation, these are the issues that the people of Brunswick live with every day. It was encouraging to hear the Mayor of Brunswick address the crown on stop #10 of the Jailed for Justice Tour. He spoke about addressing the concerns of the citizens and banning together to make improvements in the city. During our community conversation attendees pledged to work closely with the Mayor to get their issues addressed, such as getting the roads fixed and addressing safety concerns. This is the type of head on problem solving that we will need in order to build and live in the types of communities that we strive for. Being part of that process and seeing it unfold in front of you really gives me a sense of hope that this can spread all over the state, to every town in Georgia. feeling from each of our stops. 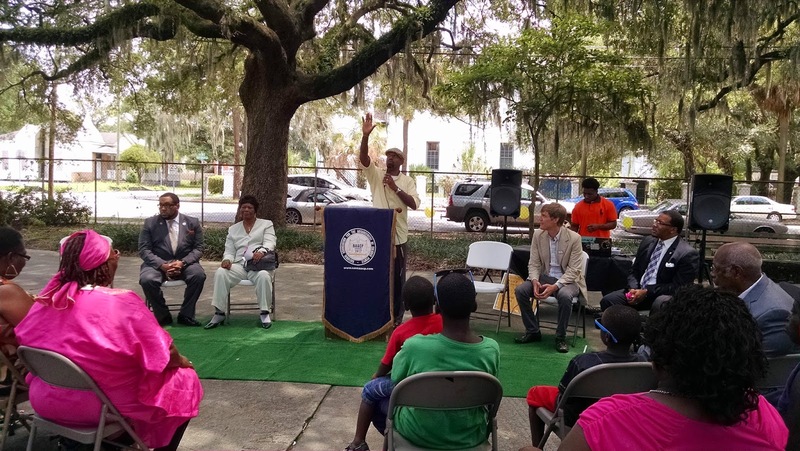 Looking back at stop #10 in Brunswick, it was yet another example of the power of the people. When we unite for change we are unstoppable. Going stop to stop and seeing the excitement of my fellow Georgians to make change happen has only cemented this to be true for me. I look forward to seeing the continued work and positive changes that Brunswick is making happen. We are building our future, and a better state, TOGETHER. Like millions of Americans, Mark Harris- a Desert Storm veteran- lost his home to foreclosure in 2012. 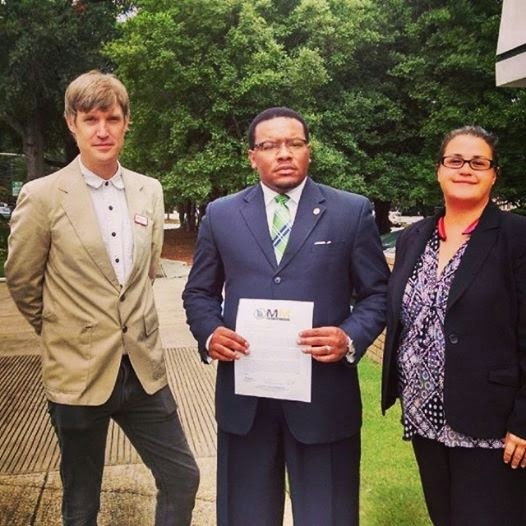 Determined to keep his home, Mark joined Occupy Our Homes Atlanta (OOHA) and mounted a nearly yearlong campaign to get Fannie Mae to negotiate, that included a trip to Washington D.C. to meet with top Fannie Mae officials directly. 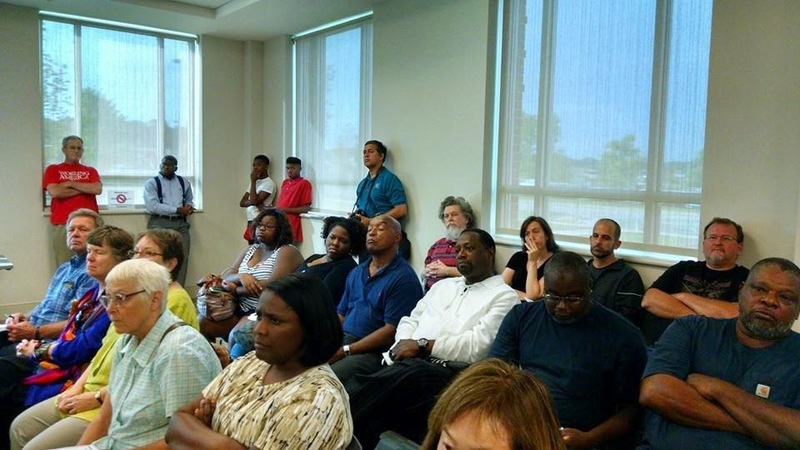 Mark believed he was still in good faith negotiations when Dekalb County Marshals showed up at the door to evict him last August. Mark, along with OOHA members Mariam Asad, Daniel Hanley, and Tim Franzen were arrested for peacefully resisting the eviction and charged with criminal trespassing. The long-awaited trial for those charges began Wednesday August 6th. Following jury selection in the morning things almost immediately took a turn for the worst. Judge Dax Lopez showed a complete disregard for the equal application of the law, refusing to hear arguments from the defendants’ attorneys, showing preferential treatment to the prosecution, and denying witnesses’ testimony. Lynn Szymoniak, a Florida attorney and expert witness for the Justice Department, flew to Atlanta to testify on Mark’s behalf, but was denied from giving testimony despite submitting credentials to the court well in advance(Lynn wrote a piece on what she would have said to the jury). The entire day’s proceedings were filled with confusion as jurors were shuffled in and out of the courtroom at the judges command. After 2 days of evidence, testimony, and powerful closing statements by the defense, the trial wrapped up late Thursday afternoon, with jurors beginning deliberations around 4:30pm. The jury was unable to reach a unanimous decision two hours later, at which point Judge Lopez sent everyone home, forcing everyone to return to court today at 8:30am. By lunchtime on Friday, the jury made it clear that no progress had been made, leaving Judge Lopez with no choice but to declare a mistrial. Throughout the trial, the state refused evidence presented by the defense. Despite that fact, the prosecution was unable to prove guilt beyond a reasonable doubt, failing to secure a verdict. "This is a victory. Our clients were not convicted and they will remain free to continue in the fight for economic and social justice. As a legal team we have been inspired by our client's courage," stated attorney Mawuli Davis of Davis Bozeman Lawfirm, one of four lawyers who took up the defendants case. He was joined by attorneys Joshua Davis, Dionne McGee, and Shawn McCullers all of whom took on the case pro-bono. Of course the outcome of the trial is good but a cruel reality needs to be pointed out here. Fannie Mae's irresponsible practices, specifically the practice of bundling and securutizing loans so they can be traded on Wall street played a key role in crashing the global economy. In a matter of months millions of hard working Americans, like Mark Harris, so the wealth they had worked a lifetime to accumulate disappear. We were told institutions like Fannie Mae and the big banks were too big to fail, that in order to protect the economy tax payers would have to bail them out. The some total of all the monies infused into Fannie and and all the big banks when added up is over 16 trillion dollars. That's enough to buy every American a home free and clear. Fannie Mae and the big banks have not had to stand trial or face jail time for their crimes intact at their critical crisis moment our government came to their aid with billions of dollars with the idea that bailing them out would somehow keep the economy afloat. Over 11 million hard working people lost their homes while countless millions lost all their wealth. There is something truly broken about a system that gives billions to thieves and locks up those standing up against the thieves. Our country needs more Mark Harris', more willing to put something on the line to resist theft of wealth and property, to resist a culture that continues to benefit a few at the cost of everyone else. While it may not always feel this way we we are in struggle OOHA has adopted a saying that Mark Harris often likes to remind us of, "When we fight, we win." That doesn't mean things always play out the way we want them to, it means that resisting injustice is always the right path. An interesting thing happened on the way to Savannah, two of our arrestees decided to take a stand again. This time it wasn’t at the state capital or the governor’s mansion, it was instead it was in the neighborhood we were coming to visit for stop #9 of the Jailed for Justice Tour. Stop 9 in Savannah was by far our most eventful location! As two of our arrestees drove into town they identified a very apparently problem right in this neighborhood. We heard from Marcus Coleman and Joe Beasley who spoke about an injustice happening mere feet from where we had stood. As they had come into town they stopped by a local convenience store and were incensed at what they found. A sign propped up outside, a supposed deterrent to shoplifting, in which lamented the owner’s struggles with shoplifting and the effect it has on his livelihood. There was not an objection to the owner trying to protect his business; there was however an objection to the manner in which this was conveyed to the community. For you see this owner’s sign also included a picture of a young black man behind bars. Arrestee Marcus Coleman delivered an impassioned speech to the audience, “How can you go in there, and shop there, and let that be the message that is being sent to your neighborhood?” As he went on you could see the passion in his face and hear it in his voice. “Our young men need to know they are more than that, they can be more than that; they have to stop seeing these types of messages every day. A message that says you’re going to be nothing, you are going to fail.” Speaking to an audience and a group of younger children he spoke of the fact that in American 1 in 3 black men will go to prison in their lifetime. This seems to, unfortunately, fit right into some of the main concerns of Moral Monday. A concern that stems from a for profit prison system that makes their business off of incarceration, mostly the incarceration of young men of color and the poor. How can we live in a state where the prisons are being expanded and the state is guaranteeing they will fill those extra beds? What motivation is there for our society to rehabilitate these men and women and help them transition back into society? As brother Coleman pumped up the audience an amazing thing happened. Right there and then we were able to facilitate a positive change in the neighborhood. The owner of the store came out and apologized and pledged to remove the sign. They shook hands we were able to make an instant and positive change just by coming together and confronting a wrong. That is what Moral Monday is all about. This is about uniting together for a common cause, to stand up in the face of things that are wrong and say we aren’t going to tolerate it. 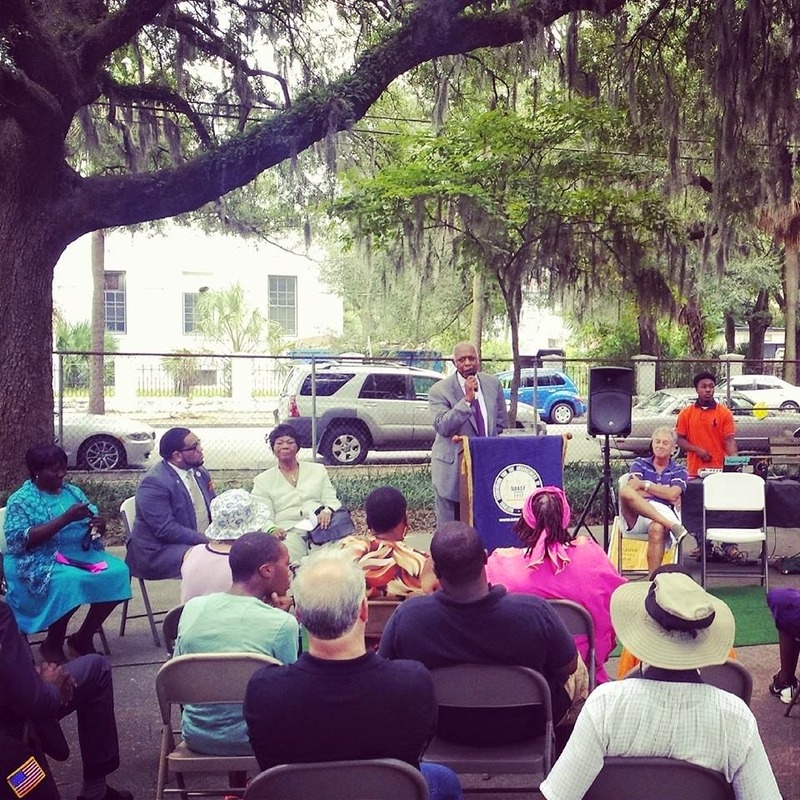 Today Savannah took their stand, their first Moral Monday action was to send a more positive visual message to their neighborhood! On Stop 8 of the Jailed for Justice Tour we visited Statesboro and were greeted with a warm welcome! 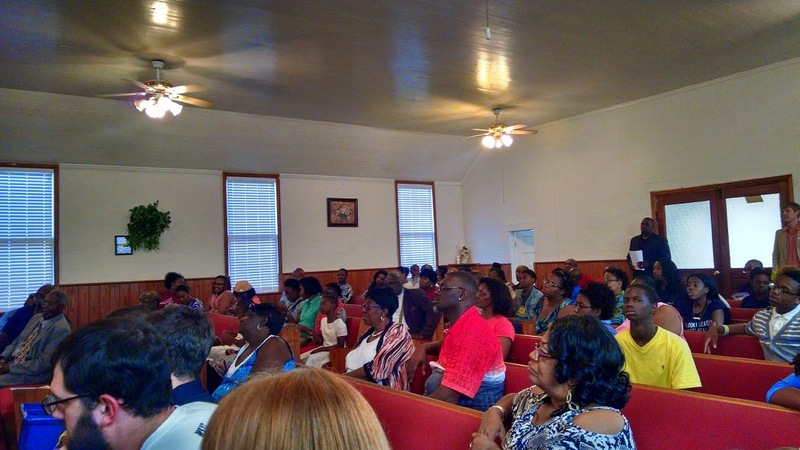 Located in the hometown of NAACP President, Dr. Johnson, for stop 8 of our tour the people of Statesboro turned out to hear from a diverse group of speakers discussing their experience being jailed for justice. We spoke about Medicaid expansion, we spoke about the need to repeal stand your ground, but most importantly we spoke about the need to ban together and fight injustice. As we gathered on the front steps of the Bulloch County Courthouse it was a fitting place to gather to speak about fighting injustice. We were standing mere feet away from the location of the last lynching in Georgia. Carried out in the court yard this atrocity did not occur in the 20s, 30s, or 40s, no this was carried out in Georgia in the 1960s. I have to admit that when I heard that my mouth dropped open. I had expected to hear that this had occurred long ago, but the truth is our past is more recent then we might like to think. So we gathered in this place of great injustice to speak about seeking out the justice we know every Georgian deserves. 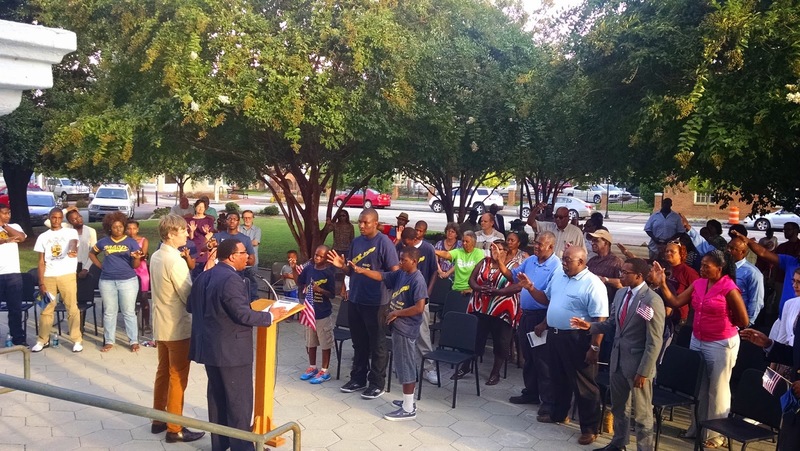 We speak often of our diverse coalition and that was clearly evident in Statesboro. We met an amazing group of young people with the NAACP who have been working in their communities to make Georgia a place of justice. We heard from many people, old and young, black and white, but we all shared the same message. We will not, cannot, and should not stand for the racist, extremist policies that are spreading around our nation. We demand to live in a place where all of our citizens are respected and can live with dignity. Today, we met the people of Statesboro who will make this a reality. Hearing those kind words really touched me and cemented why I have decide to subject myself to arrest this year. No mother should have to raise her child in this nation and have to be afraid. This is bigger than you and me, it is about recognizing an injustice and taking a stand against it. That is what is so powerful about Moral Monday. It is a chance for us to unite and work together towards our common goals for justice and peace. Statesboro left quite an impression on me; I hope Moral Monday left an impression on Statesboro! Wow, what an eventful day we had in Augusta Georgia! 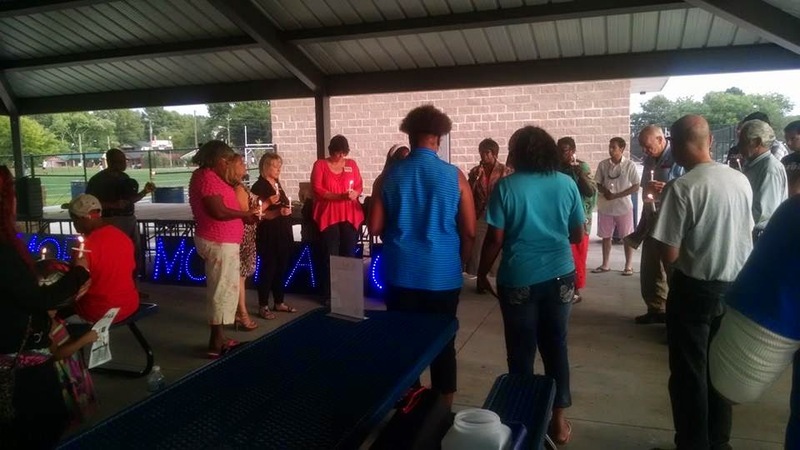 Big thanks to the Augusta NAACP and Antioch Missionary Baptist Church for organizing our stop. It was immediately clear that organizers put a lot of energy into putting our tour stop together and lifting up the Moral Monday Georgia Movement. There were too many faith leaders and elected officials to count. 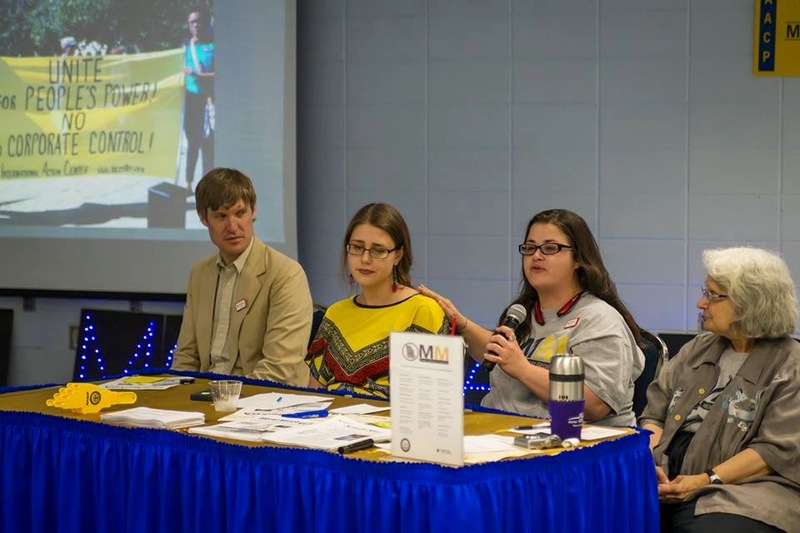 Many of us were excited to be able to engage with such a politically diverse group of folks on the issue of civil disobedience as a tool for social change in our modern times. It was also really exciting to hear what community leaders who hadn't yet engaged with Moral Monday thought about the Moral Monday movement. One of our goals of the tour has been to forge the relationships we need to create the statewide movement that Georgia needs to turn the tide against the extremist, economically insane agenda that continues to privilege a few at the cost of everyone else. Peggy Marx, Greg Aims, Jackie Rodriguez, and Rev Francys Johnson all gave amazing testimony highlighting the reason why they engaged in civil disobedience and why the time is now to go all in for regular everyday Georgians who continue to suffer under immoral public policy our state. 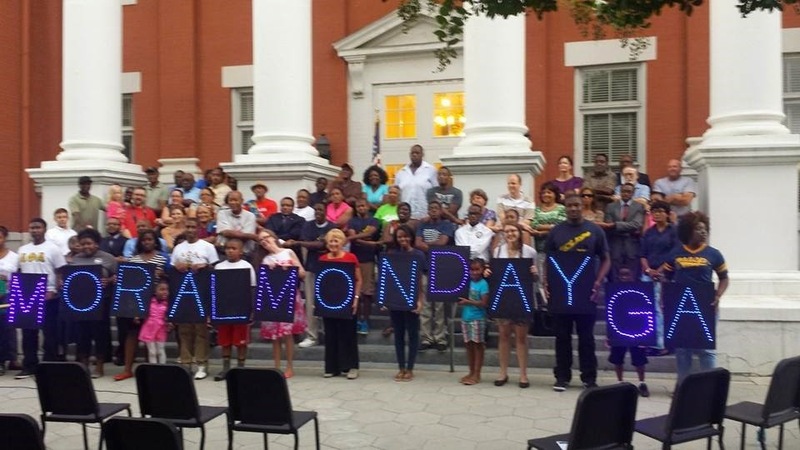 Another exciting surprise in Augusta was that the Mayors office created and framed an official proclamation stating that August 3rd will hence forth be Moral Monday Jailed for Justice Day! Pretty wild right? As at each stop we asked folks to commit to joining us August 23rd in Atlanta for the Moral March in Georgia. 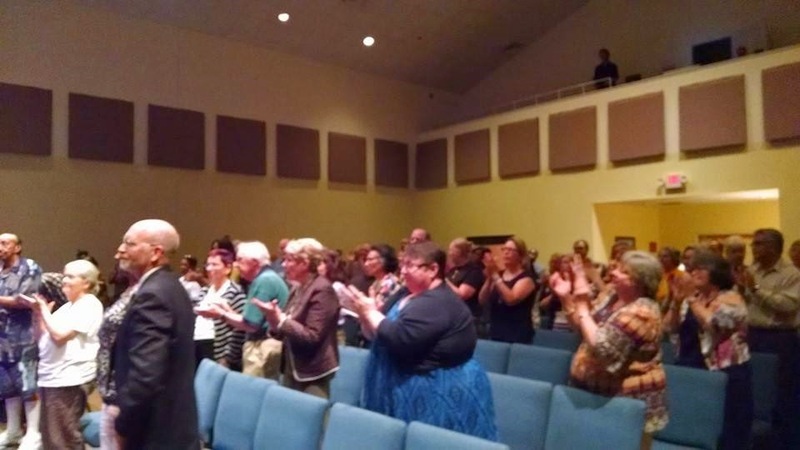 Almost everyone in the packed church enthusiastically committed to make the trip! We were all really excited to be rolling into Athens. As some may know Clarke County, despite being home to the University of Georgia, has the highest poverty rate of any county in the state. Clarke County has great potential to play a key role in changing the political landscape in Georgia. There's something exciting brewing in Athens, which is part of Clarke County, and many of the groups organizing the change Athens so desperately needs helped organize our stop including Athens 4 Everyone, The Economic Justice Coalition, and the Athens/Clarke County NAACP. 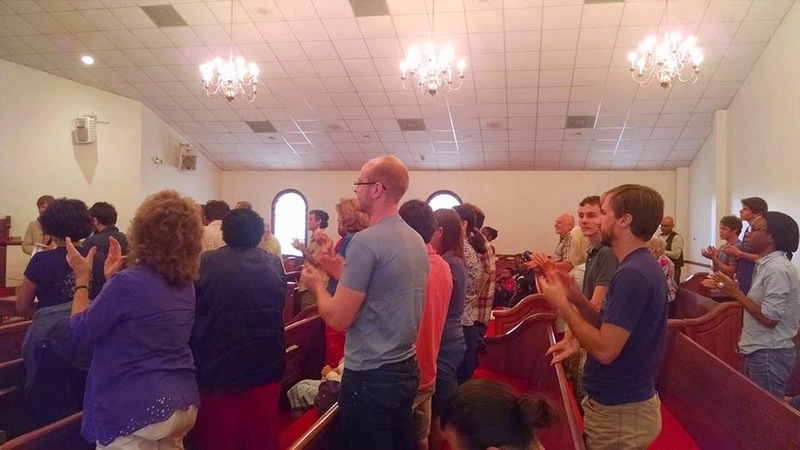 The Athens tour stop managed to fill most of the pews at East Friendship Baptist Church and the turnout, like every stop so far, was a true cross section of the local community, a rainbow coalition of young old, white, black, brown, gay, straight, male, female, and everyone inbetween. The panel included Joe Beasley, John Slaughter, and Peggy Marx who all recieved a standing ovation after giving truly moving testimony about why they were willing to risk arrest in order to stand in the way of an immoral, extremist, economically insane agenda that year after year benefits just a few Georgians at the cost of everyone else. After the panel local organizers talked about issues their organizing around, what a Moral Monday Athens would looks like, and strategies to increase voter turnout in November. We were also excited that folks in Athens seemed really committed to coming together with people all over the state on August 23rd for the Moral March on Georgia. 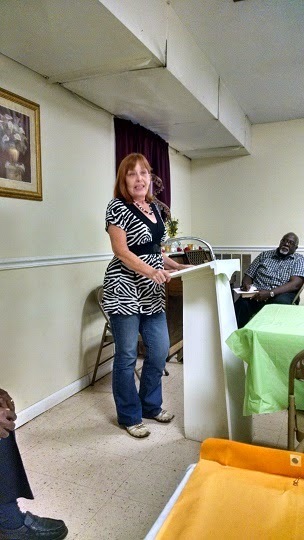 I had the privilege of being a speaker in Carrollton for stop five of our Jailed for Justice Tour. I have to admit that I am generally more comfortable working behind the scene, but I knew that it was important that I step outside my normal comfort zone and share my story. If we can stand up and say, I am just like you; this was a hard choice but we were able to do it and you can too. I hope that will inspire someone else to become just a little more involved in building a movement for change. Maybe you cannot take an arrest, but there are lots of ways to support the movement. One thing that I hope sharing these personal stories does is impart to people that we have all become part of something much bigger than our arrest. We have become part of something that has raised our consciousness, raised our voices, and is building a movement. When I looked around the room, nestled inside the West Georgia University campus, I saw the faces we need to make this movement a success. I saw all races and ages, coming together around the same issue and similar struggles. During the community conversation I saw the fire and passion that we need to make a better Georgia a reality. 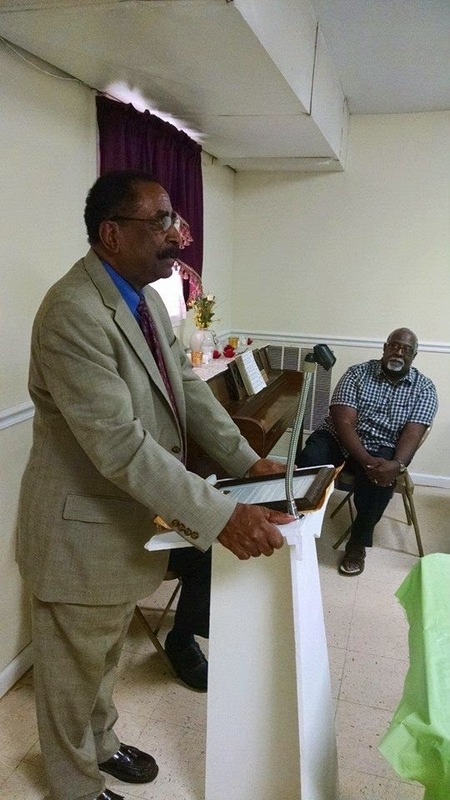 When we kicked off the program and I heard the local NAACP president speak of their long standing partnership with the local League of Women Voters I could not have been more thrilled. That foundation, that relationship, is what we need to build within all of our progressive organizations. 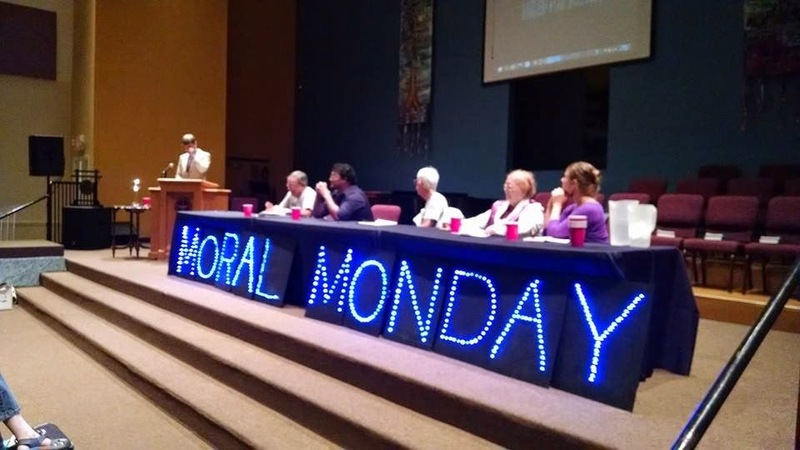 That is the fundamental idea that Moral Monday was built upon and it already exists in Carrollton. Now is the time to build on that relationship and expand it within your community. 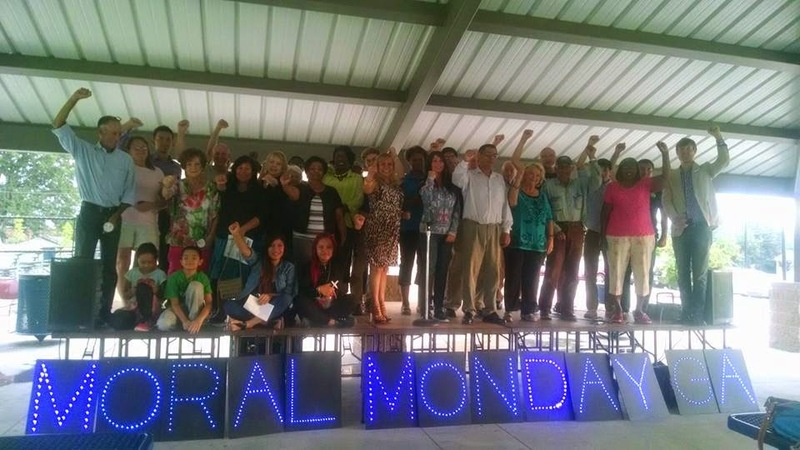 One thing we like to say about Moral Monday is that it is a call to action, a banner under which to unite for the common good, and that is what has happened over 80 times this year. We have been called to take action, with over 80 arrests, as individuals to create a powerful movement that demands we be heard, that demands we bring attention to injustice, and demands change. On August 23rd at 10am we will rally at the capital and you will have the chance to join in this fight, to unite your voice as one with us and take a stand for what is right and moral in Georgia. CLICK HERE to join and share the Facebook event. On August 23rd we are going to stand together, shoulder to shoulder; brothers and sisters of all different races, ages, and gender identities and demand what is rightfully ours. We have the right to a government that represents the people and their interest, not their own self-interest. We have the power to demand change in Georgia but we can only do it with your help. Please CLICK HERE to join and share the Facebook event for our march to demand change! 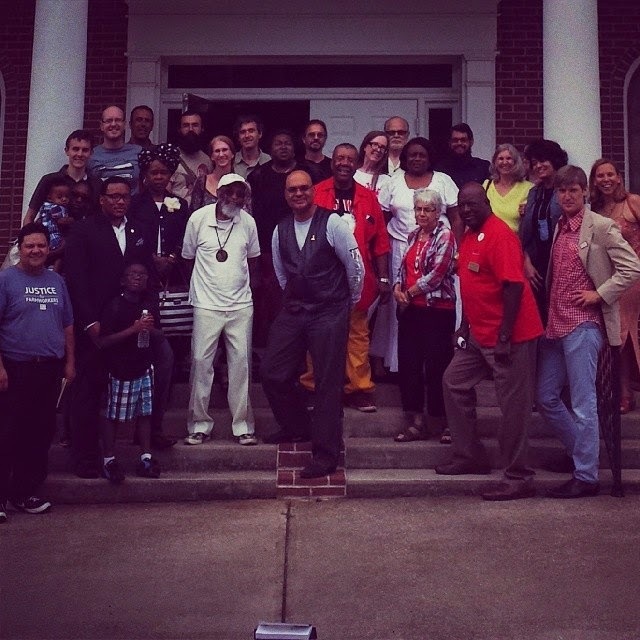 We were super excited to head to Dalton Georgia for our 4th stop on the Jailed For Justice tour for a number of reasons. The organizers of the event had let us know ahead of time that they were really interested in having a focus on immigration reform as Dalton has a very high percentage of Latino’s and many in their active groups our undocumented youth. 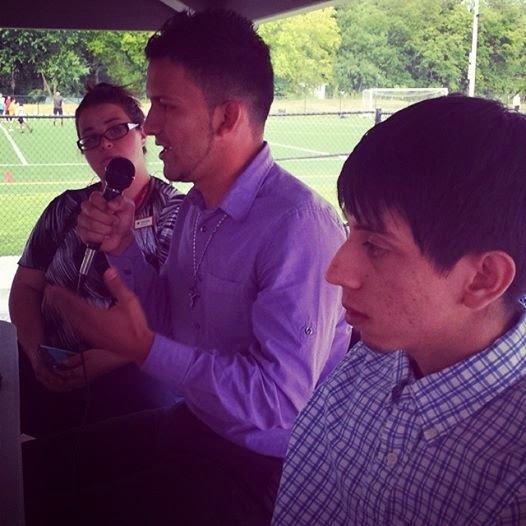 This was a great opportunity for us to invite Georgia Dreamers, Lucino Gropar and Arturo Martinez, who had been arrested during a protest outside the Georgia Board of Regents meeting earlier this year, an action that was co-sponsored by Moral Monday Georgia. For those that don’t know undocumented people are banned from attending the top five public universities in Georgia and must pay international tuition at any other publically funded schools in the state. Georgia is one of the few states in the nation that has gone so far to make young immigrants like Lucino and Arturo feel especially unwelcomed to receive an education. When we showed up to the venue it was brimming with action. There was a whole line of amazing food, an amazingly diverse group of black, white, brown, old, and young people, all excited to be there. Turnout was great thanks to a really great local turnout effort by Dalton organizers. Lucino, Arturo, and Jackie Rodriguez all gave really heartfelt amazing testimony about their path to civil disobedience which was interrupted multiple times for applause. After the panel we opened it up for Dalton residents to share their experience, talk about what it would take to build a Moral Monday movement in Dalton, and what fights our winnable in the area. We also asked folks to commit to bringing carloads of folks to the August 23rd Moral March on Georgia. We closed the evening with a truly powerful candlelight vigil for just immigration reform and all the innocent children being held at our border.